This makeup artist was inspired by some of YouTube's biggest gurus, Tati Westbrook & Desi Perkins, to convert her "bonus room" into a beauty room & home office. After watching my first beauty room e-design, she reached out & I was so excited to collaborate with her to create her beauty dreamscape. This design was everything I love about online design -- collaborating with someone fun & creative, designing remotely with someone I'd otherwise NEVER meet, and most importantly, LITERALLY transforming a room & a life. 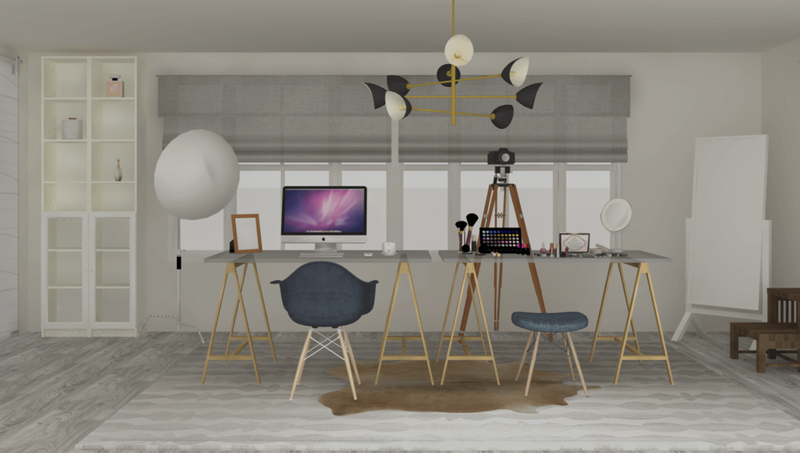 having ample work space, in addition to a seating area, essentially making this her "woman cave"
What was truly great about this space was that it was more for both personal & professional use -- a place to keep her MASSIVE make up collection, work with clients, plan appointments, etc. ; but also a place for her to experiment with makeup looks, "glam out" when bored, and just be a girl. Using the inspiration looks of her fav beauty gurus, I put together a mood board that was effortlessly & causally glamorous & chic. With an approved space plan & mood board, shopping was underway, starting with any pieces that would have a long lead time and/or be difficult to source. Deciding on the lighting, desk, and seating area chair (yes, just the chair, lol) set the tone for the rest of the shopping, as these were some of the marquee pieces for the design. Entering this stage also allowed me to put together renderings that would give her a visual of how her space would come together. Many times, with e-design especially, it's hard to visualize how all this conceptual stuff will come together in real life. This is why I love putting together renderings for my clients! Head over heels for the final rendering reveal, we started ordering pieces for her to put together her dreamscape! I can't wait to see how the final real life design comes together!